Home » O.J. Simpson & Domestic Violence Part 7: What Did We Learn? This is the final part of our multi-part series focused on O.J. Simpson and domestic violence. Part Seven explores the claims of Susan Forward & Jennifer Ameli and reviews our findings in parts one through six. According to the New York Times, Kensington University had its right to do business in California taken away in August 1994. Serving about 500 students locally as well as in Japan, Kensington calls itself a “distance-learning school,” saying its students receive instructions in law, business, education, psychology and engineering by videotapes and telephone calls. Kensington University has no classrooms, laboratories or dorms. Its students don’t play football, join fraternities or linger dreamily on a quadrangle. In fact, the entire campus is housed in a small Glendale office building. Recruiting from across the nation, the school runs a program in which students studying entirely at home can earn anything from a bachelor’s degree to a doctorate–all without ever attending a single class or even meeting their instructors face to face. In one case, reviewers found that the school awarded a doctoral candidate in psychology credit for reading magazine articles and doing about a dozen short reaction papers. A later report said the school also awarded doctoral degrees after as little as four months’ work. On June 14, 1994 the most dangerous place in California was the path between Susan Forward and a television camera. Forward, a licensed clinical social worker, said during numerous media interviews on June 14, 1994 that she had counseled Nicole Simpson on two occasions and that Simpson told her she had been battered and threatened by O.J. Simpson. There are so many issues with the “doctor’s” claims. Most notable is Forward’s claim that in early 1992 Forward was trying to convince Nicole Simpson to leave O.J. Simpson. Considering that Nicole Simpson had filed for divorce and moved to Gretna Green prior to her two sessions with Susan Forward, Forward’s claims do not appear to be credible. If she is not credible on this claim, logically one must question the other claims Forward has made about her two sessions with Nicole Simpson. In November 1995 Susan Forward had her license suspended for violating patient confidentiality when she made public claims about her sessions with Nicole Brown Simpson, the California Board of Behavioral Science Examiners barred Ms. Forward from seeing patients for three months and Forward agreed to be on probation for three years. It’s difficult to believe that in just two sessions that Nicole Brown Simpson disclosed everything that Susan Forward claims; it is certainly possible but not probable. Susan Forward’s doctorate from Kensington University makes a degree from Trump University look credible in comparison. She is an ethically-challenged, publicity hungry individual who appears to have a history of embellishing the truth in order to make herself a focal point. She’s the Dr. Nick Riviera of psychology; although even the fictional Dr. Nick looks down on folks with a doctorate from Kensington University. Jennifer Ameli, now known as Jennifer Ameli-Bakhtiar, M.F.T., Ph.D. (per a fraud lawsuit filed against her by former clients), is a Southern California therapist who came forward after the criminal trial to claim that she had numerous counseling sessions with both Nicole Brown Simpson and Ronald Lyle Goldman in 1994. Ameli did not contact the Los Angeles Police Department or the Los Angeles District Attorney’s office to share this claim, she contacted Geraldo Rivera and the National Enquirer following O.J. Simpson’s acquittal. On the February 21, 1996 episode of the CNBC talk show, Rivera Live, host Geraldo Rivera reported that the therapist, whom he identified as Jennifer Ameli, told him that she was willing to testify in the Goldman family’s wrongful death lawsuit against O.J. Simpson. Rivera reported that Nicole Brown Simpson had visited Jennifer Ameli just three days before she was murdered on June 12, 1994. Ameli told Rivera that during the June 9, 1994 session Nicole Brown Simpson told her that she feared that O.J. Simpson would hurt her. Ameli claimed to be in possession of session notes and invoices for her separate sessions with Goldman and Brown-Simpson. That same week the National Enquirer, the same publication which published the fabricated “Nicole” diary entries, published a report based on an anonymous “insider who knows what Ron and Nicole told the therapist.” According to the Buffalo News, the National Enquirer article claimed that Ron Goldman was romantically involved with Nicole Brown-Simpson. Police reports reviewed by The Associated Press show that on Sept. 15, 1994, Ameli reported a burglary at her office, saying files, a calendar book and other papers were taken. The police report said there was no sign of forced entry. There was no mention in the police report that the material pertained to Goldman or Nicole Simpson, but the Enquirer reported that the files did relate to them. Sources also told the AP that lawyers in the civil case reviewed Ms. Simpson’s calendar book and diary and found no entries for Ameli, her address or her phone number. Jennifer Ameli, who says she treated both Nicole Simpson and her pal Ron Goldman separately during the months before they were slaughtered on June 12, 1994. Ameli has no records to prove she treated the two, but she reported to police in September 1994 that her office was broken into and files were stolen. In her deposition, Ameli admitted she misled cops when she told them Nicole had paid for sessions by check, and that she had paid for some of Goldman’s visits. “I didn’t know what I was saying,” Ameli said, adding that police were “pushing me. “According to a 1994 police report, cops dismissed her claims that Nicole’s and Goldman’s files were stolen in a break-in. She had no records to back those contentions, cops wrote, and refused to take a lie-detector test. But during her deposition, Ameli’s lawyer said he could produce at least one patient who would testify that she participated with Nicole in a group therapy session for battered women two weeks before the killings. While some may point to the fact that Goldman family attorney Daniel Petrocelli vouched for Ameli’s credibility in his 1998 book about the civil lawsuit. It is important to note that every single “detail” which Petrocelli mentions in his book as he desperately attempts to convince the reader that Ameli is credible had been publicly reported during the criminal trial. Ask yourself this: If Daniel Petrocelli actually believed that Jennifer Ameli had one iota of credibility, why didn’t he call her as a witness? Daniel Petrocelli, Attorney for the Goldman Family and Donald Trump. From all of this information, it is clear that Jennifer Ameli’s story is not based in fact. This seven part investigative series on O.J. Simpson and domestic violence is the first in-depth, factual examination of this subject. The goal of this multi-part series was to completely vet the allegations (both proven and rumored) regarding O.J. Simpson’s history of domestic violence prior to June 13, 1994 in order allow for a fully informed understanding of the facts. In each part of this series the reader was provided with links to the source materials that were utilized. It is important to share that this series was not written to achieve a certain conclusion, in fact more often than not the vetting process would reveal information that was previously unknown to us but critically important. This series was guided by the facts revealed throughout the vetting process. O.J. & Marquerite Simpson, 1968. O.J. Simpson and Marguerite Whitley were married for approximately twelve years (1967-1979). Following Mr. Simpson’s arrest in 1995 Marguerite Whitley Thomas was interviewed by LAPD. During that interview told police she was “never battered or beat up” or physically assaulted by O.J. Simpson. However, in late-June 1994 LAPD Officer Terry G. Schauer contacted CNBC host Geraldo Rivera to claim that he had responded to a domestic violence call at the Simpson’s home in the 1970’s. Officer Schauer claimed that officers took Marguerite to a local Holiday Inn however there is nothing to substantiate this claim – no paperwork or other evidence and none of Schauer’s fellow officers have affirmed his claim. We also learned that Schauer has a tendency to manufacture tales of supposed encounters with celebrities and re-telling his tale but changing the name of the celebrity. To this day, the former Mrs. Simpson continues to maintain that she was “never battered or beat up” or physically assaulted by O.J. Simpson. The second part of our series explored the New Year’s Day 1989 domestic abuse of Nicole Simpson by her husband, O.J. Simpson. Detective Edwards testified that “then a woman came running out of the bushes to my left, across the driveway.She was a female Caucasian, blond hair. She was wearing a bra only as an upper garment [bra] and she had on dark — i believe it was a dark lightweight sweatpants or night pajama bottom.” When the woman was directly across the gate from the detective she “started yelling, “he’s going to kill me, he’s going to kill me.” then she pressed the button which allowed the gate to open and then she ran out [to the other side of the gate] again yelling “he’s going to kill me.” Detective Edwards asked the woman “‘well, who is going to kill you?’ she said, ‘O.J.’” The detective responded “‘O.J. who? Do you mean the — the football player, O.J. the football player?’ and she said, ‘yes, O.J. Simpson, the football player.’” The woman then told Detective Edwards that she was Nicole Simpson and O.J. Simpson was her husband. On January 3, 1989 the case was assigned to Detective Mike Farrell of the West L.A. Division’s Crimes Against Persons detail. Detective Farrell called the Simpson residence and spoke with both O.J. and Nicole. Speaking with Detective Farrell, O.J. Simpson took responsibility for causing the injuries to Nicole. Detective Farrell made an appointment to meet with Nicole at the next day at the West LA station. During that private meeting with Detective Farrell, Nicole indicated that she wished to drop all charges against O.J. Simpson. Detective Farrell shared this information with the city attorney’s office. The city attorney’s office instructed Detective Farrell to check with his fellow officers and police records to determine if there were additional incidents at that location or involving the Simpson’s. 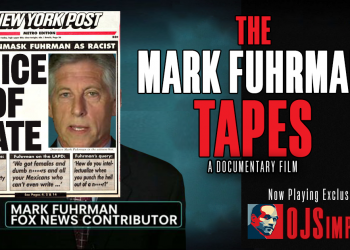 Farrell’s investigation did not find anything in LAPD records however one officer came forward to claim that he responded to an incident at the Rockingham estate: Mark Furhman. It was Fuhrman’s account of his response to an incident at Rockingham that caused the city attorney’s office to prosecute. An in-depth investigation of the shocking claim, which emerged in conjunction with the 1989 domestic violence incident, that LAPD had responded to eight similar incidents of domestic abuse but never arrested O.J. Simpson. Through an exhaustive search of the facts surrounding this claim we were able to conclusively determine that, prior to the New Year’s Day 1989 incident, there is only evidence of one additional response by LAPD to an incident between O.J. and Nicole Simpson: The incident responded to by Mark Fuhrman in 1984. It is important to note that the incident which Fuhrman responded was not an incident of physical abuse just verbal, loud argument and minor property damage. In part four we learned that immediately following the New Year’s Day 1989 incident O.J. Simpson had his attorney Skip Taft create a legally binding document stating if he ever again touches Nicole Brown Simpson in anger, strikes her, does anything of the sort, their prenuptial agreement is null and void. O.J. Simpson signed this legally binding document. Nicole had not requested this, O.J did it not only to say he was sorry, but to say he was responsible. Without a prenuptial agreement, California law would have entitled Nicole to half of O.J.’s finances and property. O.J. Simpson’s fortune in 1989 was estimated to be more than 10 million dollars (adjusted for inflation, this would equal $19,645,403.23 in 2017 dollars). However the prenuptial agreement the couple signed was clear: what you owned prior to marriage was untouchable in divorce. Nicole Brown Simpson filed for divorce in February 1992. The divorce was finalized in November 1992. At no time in the divorce proceedings did Nicole allege any domestic abuse other than the 1989 incident and did not make any allegations which would void the prenuptial agreement. If Nicole had testified about an incident of domestic violence committed by O.J. after January 1, 1989 she would have been entitled to half of his 10 million dollar fortune; but Nicole never claimed that O.J. touched her in anger, hit her or anything of the sort between New Year’s Day 1989 and the date their divorce were filed. So one can logically conclude that either O.J. Simpson did not commit additional acts of violence against Nicole between January 1, 1989 until their divorce was finalized on October 15, 1992 or Nicole did not want 5 million dollars. Part five begins with a comprehensive timeline of the relationship between O.J. and Nicole Simpson (and their relationships with others) between January 1992 (when Nicole and O.J. separated) and May 1994. This timeline provides the most detailed insights into what was going on in each of their lives during that time frame. The main focus of Part Five is Nicole Brown Simpson’s call to 911 on October 23, 1993 which has been fully restored to reveal almost all of the comments made in the call’s background by O.J. Simpson throughout the call. You are encouraged to listen to the entire, unedited audio and form your own conclusions. Also included in this presentation are the comments made to LAPD by both O.J. and Nicole which were secretly recorded by LAPD Sgt Craig Lally. LAPD officers had placed O.J. and Nicole in separate parts of the property (Nicole in the kitchen of the main house and O.J. in Kato’s guest house) to allow each to be candid and speak openly about what occurred that night without fear of the other hearing them. On the Lally Tape, Nicole Simpson can be heard telling the LAPD Sgt that O.J. “hasn’t hit me in four years” — referring on October 25, 1993 to the January 1, 1989 incident as the last time O.J. had become physical with her. In addition to revealing O.J. Simpson’s comments, today’s release marks the first time in over two decades that the complete, uncensored audio of Nicole Brown Simpson’s 25 October 1993 calls to 911 is available to the public. Previously the public only had access to a few short excerpts of these calls. Also included in Part Five is the excerpt of O.J. Simpson’s civil trial deposition regarding the details of the October 23, 1993 incident. We highly encourage you to watch this excerpt after listening to the audio of the 911 call and keep in mind that prior to our publication of the 911 call no one knew exactly what O.J. Simpson said during the call. You will be stunned by the fact that O.J. Simpson’s testimony in the deposition mirrors his comments on the call. Part Six details the findings of Dr. Lenore Walker, the trailblazing researcher who, in the 1970’s, first identified the cycle of violence known as the Battered Woman Syndrome. Dr. Lenore Walker agreed to evaluate O.J. Simpson and potentially testify in the 1995 criminal trial. To fully and accurately evaluate O.J. Simpson, Dr. Walker spent over 40 hours interviewing him and subjecting him to multiple tests. The sessions between Dr. Lenore Walker and O.J. Simpson were held in late-1994 and early-1995, while Mr. Simpson was awaiting trial. Walker explained that there are three general categories of batterers. One common type is mentally ill. Another group is violence-prone, in and out of the home. The third, less pathological, group seeks power and control. Simpson’s problems fell into the third category. The New Year’s Eve beating in 1989 frightened Simpson, the doctor explained. He was shocked by his capacity for violence. And he knew that as a black man, he faced double condemnation, first as a batterer, second because he had beaten a white woman. This might destroy his career as a pitchman. His offer to tear up the prenuptial agreement if he beat her again wasn’t aimed at reassuring her. He was setting up a penalty system for himself. Now a failure to check his violent impulses could cost him millions in a divorce. O.J. wrote that letter as much for himself as for Nicole. The third phase began post-divorce. Simpson suffered deeply from his loss of control over Nicole, over his life. Yet he wasn’t a classic stalker. Walker had studied Simpson’s calendar. Stalkers don’t travel to golf tournaments, she explained. They don’t see other women. They don’t redecorate the bedroom and bath for a new girlfriend, as Simpson was doing for Paula Barbieri. Stalkers are single-minded, monogamous. O.J.’s pattern was closer to that of a heartsick lover, Walker felt. The incident with Keith Zlomsowitch was more a matter of jealousy than of stalking. Mr. Simpson could control his anger. He had a bad temper, but he yelled and left, or just left. Walker had administered a battery of tests: the Minnesota Multiphasic Personality Inventory, the Rorschach test, the Wechsler Scale of Intelligence test. Mr. Simpson’s cognitive functioning was normal. The test results demonstrated that Mr. Simpson’s intelligence was in the superior range. Mr. Simpson’s social skills were found to be remarkable. Even one incident, Mr. Simpson understood, characterized him as a batterer. Did you know that many of the corporations that are considered to be best-in-class for diversity & inclusion were once among the worst? Many of the worldwide leaders in diversity & inclusion were companies which only began to take the idea of creating a respectful, inclusive, understanding work environment after discrimination, harassment and other lawsuits cost them tens or hundreds of millions of dollars. In some cases it was that one incident that caused the radical change and a positive transformation of corporate culture to nurture an inclusive, respectful workplace. Based on all of the facts that we understand about O.J. Simpson and domestic violence, there is a strong possibility that after physically assaulting Nicole on New Year’s Day 1989 and the resulting criminal charges that he responded in a manner similar to those corporations whose diversity & inclusion practices radically changed as a result of discrimination lawsuits. Immediately after his abuse of Nicole on New Year’s Day 1989 O.J. Simpson began to attend counseling sessions (prior to being ordered to do this by the Court) and he created a self-imposed legal/financial penalty should he ever again commit an act of violence against Nicole. The added clause to his prenuptial agreement meant that if there was one additional incident of violence, he would lose half his fortune and be forced to sell his beloved Rockingham estate. During their divorce proceedings Nicole Brown Simpson never attempted to enact the clause to the prenuptial agreement and claim a single act of domestic violence occurred after the New Year’s Day 1989 incident. Pictured L-R: Kris Jenner [Kardashian], Caitlyn [Bruce] Jenner, Cynthia ‘Cici’ Shahian Bussey, David LeBon, Keith Zlomsowitch, Robin Greer, Candace Garvey, Faye Resnick. While Kris Jenner [Kardashian], Caitlyn [Bruce] Jenner, Cynthia ‘Cici’ Shahian Bussey, David LeBon, Keith Zlomsowitch, Robin Greer, Candace Garvey, Faye Resnick and others have and continue to jump at any opportunity to go before the camera and make claims of hearing about or witnessing numerous acts of domestic violence by O.J. Simpson against Nicole Brown Simpson; none of those men and women testified to the alleged acts at the criminal or civil trial. Although most, if not all, of their claims would not have been admissible in the criminal trial, Fred Goldman’s successful lobbying of the California legislature to pass and enact a major change to the hearsay laws meant that if their claims were credible they would have been admissible in the civil lawsuit. Considering that Daniel Petrocelli’s theory was that the murders were a result of increasing domestic abuse, it is most curious that none of the claims of these men and women were included in the plaintiff’s case. One must question the credibility of the claims that these men and women continue to make on television if they were not deemed to be credible enough or were not willing to swear to tell the truth. As we stated in Part One, our position on domestic violence is one of zero tolerance: There is absolutely no justification for violence against one’s partner whether it physical or mental violence. Anyone who commits such violence even once, including O.J. Simpson, is a scumbag. Period. Any violence against one’s partner is unacceptable and it is never, ever justifiable – even if it only occurs once. As a society we, rightly, treat O.J. Simpson and former Baltimore Raven Ray Rice like pariahs for abusing women. But unfortunately, the news media rarely holds accountable so many public figures who assault their partner. We encourage you to watch 100 Celebrities Arrested for Domestic Abuse, a short documentary released in 2016 which documents 100 famous domestic abusers who were given a free pass by the media and, in turn, not held accountable by the public. While the news media and the public began to treat Ray Rice like a pariah immediately after the release of the horrific footage of Rice punching his now-wife, the backlash against O.J. Simpson for his act of domestic abuse only began following the death of Nicole Brown Simpson. As a society we should view every single one of the men and women featured in 100 Celebrities Arrested for Domestic Abuse (and all of the men and women arrested for abusing their partners since 2016) with the same disdain, disgust and repulsion as we view O.J. Simpson and Ray Rice. The cycle of abuse will not end until the public completely rejects these abusers and any project which they are associated.